What’s that? No harvest yet? But the plants are so huge! The leaves are so beautiful and the plants are quite healthy. The veggies start to form and it all seems so promising. Then the unexpected happens; the squash starts to shrink and wither away. Someone’s got a problem. Mr zucchini appears <unable to perform>. Looks like somebody needs a little blue pill. Er, not exactly. Let’s blame the absence of our little bee friends. The crazy summer weather has many of them just trying not to get cooked alive. They haven’t always been making it over to the squash patch to spread a little loving, and pollen, around. What to do? What to do? First, let’s go back to the bees part of the birds and bees talk that some of you got in high school / middle school / elementary, depending on when and where you were born. I promise you that this is something you did not hear in health class. 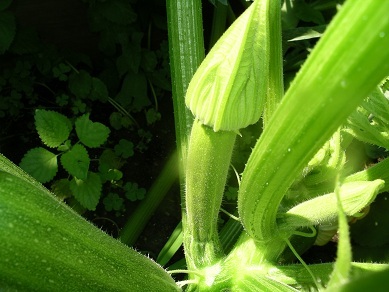 Zucchini is interesting in that there are not boy parts and girls parts in its flower. No, there are actually boy flowers and girl flowers. And we need to be the wing man for those boy flowers so they can get lucky and drop off some pollen in those girl flowers. Let’s set the mood for some pollination magic. Let’s start with the lighting; natural works in this case. Put on the mood music. Listen to some Barry White? Nine Inch Nails? Frank Sinatra? Take your pick. After all, you are a major player in this show. How about you slip into something more comfortable? My personal choice is shorts, tee shirt, and garden sandals. Maybe a little wine for the gardener? Keep it real and have a beer? No thanks. Better to stick with coffee. One thing I failed to mention is that the flowers are only open between 6 and 9 in the morning. The only other supplies you need are a Q-tip or a small artist’s paintbrush. Hand pollination is quite simple, really. Use the Q-tip or brush to gather pollen from the middle of the male flower and lightly brush the middle of the female flower to deposit the pollen. OK, I will save you the embarrassment and tell you the difference between the male and female flowers. The male are simply attached to a stem. The female appear to be attached to a miniature zucchini squash. 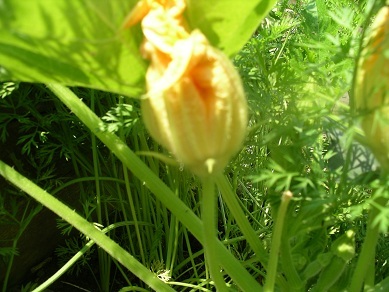 Spread a little pollination around and you will be harvesting fresh zucchini in no time.